New currency on the way. After a few years of relative stability and successful elections, Somalia’s new government hopes to reverse all that. Buoyed by donors, the International Monetary Fund (IMF) and the World Bank, the country now wants to resume printing banknotes this year. But while the decision to introduce a new currency is welcomed, observers are worried about whether the country is fully ready to turn a new leaf. ‘The question is not when, it is how,” says Mohamed Dubo, publisher of The Somalia Investor magazine. While reissuing the Somali currency “is definitely required,” Dubo says, the federal government and the central bank shouldn’t rush into printing the money, but rather invest in a gradual process that brings all stakeholders on board. Bretton Woods institutions have been providing capacity building and budget support to Somalia. Yet, as the central bank itself admits, lack of adequate resources and a monetary policy, not to mention corruption has hindered the creation of an effective system that could stop the high inflation rates or fix the largely dollarized economy. The central bank currently oversees only six banks and 12 money transfer companies, the majority of which are located in the capital. To make the process of printing and introducing the currency succeed, Aly-Khan Satchu, a Kenyan investment adviser, says that the central bank will have to start building strong “collaborative partnerships with trusted institutions across the globe.” Otherwise, he warned, we’ll see a repeat of tumbling currency crises like the one in Nigeria. The only currency note available in Somalia is the 1,000 shilling. Smaller denominations like the 500, 50 and 20 shillings stopped circulating either immediately after the war or over the years. The new banknotes are expected to be in small denominations, and the government will be expected to clarify the purchasing power of these new notes in comparison to the already circulating ones—98% of which are considered fake by the IMF. Somalia’s government will also have to do broad consultations with the private and public sectors and assure investors on what this will mean for trade and business. 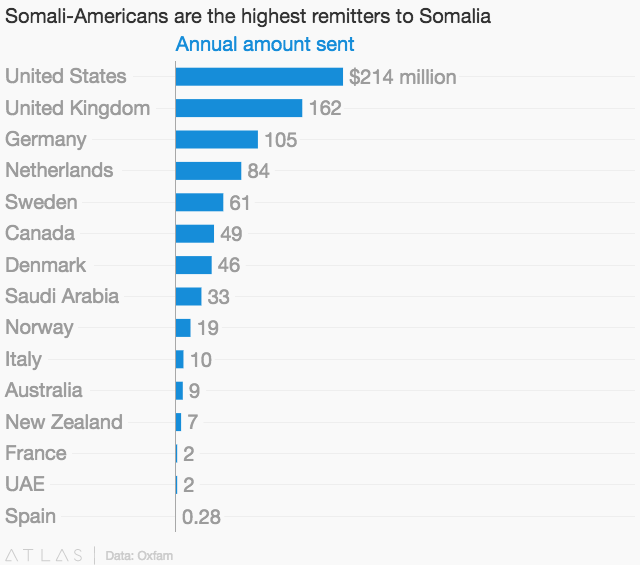 Imports account for more than two-thirds of Somalia’s $6 billion GDP, with $1.4 billion of that coming through remittances from Somalis living in the diaspora. Mobile money is dominant in Somalia, with users having the option to pay bills, buy goods or airtime, and transfer money. During the war, instead of risking to carry large bulky notes, many people opted to subscribe to the convenience of mobile payments. Hormuud, the largest telecommunication company in Somalia, reportedly has more than 2.5 million customers, majority of whom are subscribed to its e-payment service known as EVC Plus. Put another way, Somalia has one of the most active mobile money markets in the world, with 37% of the population having mobile accounts compared to just 8% with a financial institution, according to the World Bank’s Global Financial Inclusion Database.